Starting his IT career as a network administrator at a medium-sized internet café in China, Monorom, from Cambodia, is now a Consulting Network Engineer at eintellego Networks Asia office. Rom spent his years of BA degree in IT at Dali University in China. He has instructed two courses; CCNA and CCNA Security after certified as CCNP R&S. Until one day he came to eintellego Networks and has found out that Juniper knowledge is also a great thing to master for network engineers who care about their sustainable long-term career growth. Rom speaks Khmer, Mandarin, English and Thai. Certifications: CCNA, CCNP R&S, CCAI, JNCIA-Junos, JNCIS-SEC, and JNCIP-SEC. 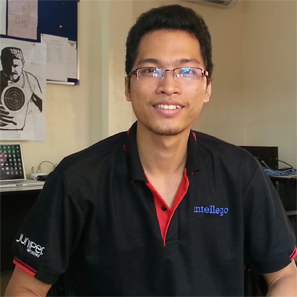 Award: In 2012, along with eintellego Networks staff – Rom, Samol won the Cisco Netriders Competition in Cambodia. Fun Fact: Rom love sports and martial arts. He performed several Taekwondo, and Bokator (Ancient Martial Art of Cambodia) action shows when he was doing BA degree in China, and was very successful on the stages.